Matty Wethers receives the traditional 'bumps' afterscoring a maximum for Edinburgh against Glasgow. Panthers joint team manager Carl Johnson believes the club have hired the best possible guests to replace star-of-the-season Simon Lambert this weekend. The prolific reserve remains sidelined after suffering a broken shoulder blade in a crash in an individual meeting at former club Kent two-and-a-half weeks ago. But club bosses reckon they have pulled off a couple of shrewd moves for two tough tests against Edinburgh. They have turned to Matty Wethers for tomorrow’s trip north of the border. The Australian starred in three title-winning Monarchs teams during 10 years with the club. He also impressed when standing in for Lambert in a recent defeat at Glasgow. And they have borrowed Rye House ace Luke Bowen for the return clash at the East of England Showground on Sunday (5pm). Bowen has impressed for his own club in visits to Alwalton in the past 18 months. Johnson said: “There is no better guest for a meeting at Edinburgh than a rider who rode there for so long and enjoyed so much success there. “Matty also did very well for us at Glasgow the other week and he deserves another booking on the back of that. “He’s had a few injuries in recent years that have knocked him, but he is a better rider than his average suggests and he could be a trump card for us. 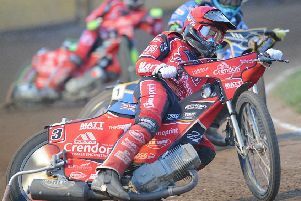 “Luke has had some very good meetings at the Showground since we came into the Premier League and he jumped at the chance to guest for us on Sunday. Popular former Panthers rider Kenneth Hansen also guests for the club in the away meeting at Edinburgh. He steps in for the unavailable Emil Grondal, who has a racing commitment in Denmark. The club use the rider replacement facility to cover the absence of injured skipper Ulrich Ostergaard. Grondal returns for the home clash at Alwalton on Sunday when R/R will again be in operation for Ostergaard.